If your journey to Windsor Castle takes you through Slough Station take a moment to go over to platform 5 and find Station Jim. Who is station Jim you may ask? He is a Canine Collector of course. A what? 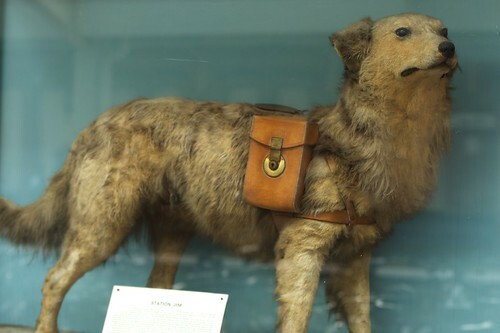 Station Jim was a dog that was found at the railway station in Slough in 1894. The small puppy was taught tricks and to stay off the tracks. He became a town mascot of sorts. The people loved him. Before long he someone strapped on a coin collection box to raise money for Widows and Orphans. He started out slow until someone taught him to bark each time he received a coin. Over two years he collected £40 (£40.00 in 1896 is equivalent to £3,822.71 in 2013). But the good times didn't last. He died in 1896. The community paid to have him stuffed and put on display. Over a hundred years later Station Jim is still with us standing guard over Slough Station.